In order to be competitive in our tight job market, I think that’s it’s not enough just to be able to describe one’s skills well. Job hunters, both in and out of library school, need to be able to manage their own professional development in a way that the skills they gain align with the competencies required by their desired jobs. Reference librarian was one of the top five job titles reported in Library Journal’s annual Placement & Salary Survey for 2012 , suggesting that, as with Mark Twain, reports of the death of reference have been largely exaggerated. Still, the fact that there are reference jobs to be had does not necessarily mean they are easy to get, and the same Library Journal’s article reports stiff competition for those jobs (Simmons College Graduate School of Library and Information Science was number one in job placement!). One of the best ways for aspiring reference librarians to succeed in the job market is to have a clear understanding of job expectations, to develop the necessary skills and proficiencies, and be able to demonstrate and discuss those abilities on their resume and in job interviews. In this column, I share the results of a survey of academic reference librarians indicating what skills and knowledge they believe is important in the field right now. In 2011, my colleague, Mary Wilkins Jordan and I developed and implemented a nationwide survey of practicing reference librarians to gather input on what competencies are most important for reference librarians in the field right now. While we used essentially the same survey, I concentrated on academic libraries, while Mary surveyed public librarians. In each case, we took a random sample of libraries from across the country, in order to get a broad and representative overview. We gave the librarians a list of 33 competencies that we had compiled using Reference and User Services Association (RUSA) guidelines as well as reviews of the literature, and asked the librarians to choose the ones they thought were important to reference librarians, and then to indicate the three most important. The survey closed with an open-ended question asking the respondents to describe any skills or qualifications that they found to be lacking in recent graduates or new hires. The respondents chose competencies grouped into three categories: general skills, technical skills, and interpersonal skills, which are summarized in the following table. Throughout the survey, respondents emphasized skills and qualities that relate to the question-answering and customer service aspects of reference. For instance, general and online search skills, as well as familiarity with both online and print reference sources were among the top rated general and technical skills. Interestingly, valuing knowledge of print resources was not correlated with either the responding librarians’ age or number of years in the field. In other words, it is not just older librarians or those who have been out of school for a long time, but a wide range of practicing reference librarians who seem to believe print resources are still important. These findings emphasize that it is still important for reference librarians to be familiar with a wide range of resources, and to be able to search and use those sources efficiently and effectively in order to help their patrons find information. While librarians certainly need the skills to search and use resources to find information, the survey also confirms that the patron is the heart of reference services. Customer service and interpersonal skills to be able to interact with a diverse patron base are among the most important for any reference librarian. Five of the interpersonal skills—verbal communication skills, listening, approachability, comfort with instruction, and adaptability/flexibility—stood out as especially important, having been selected by more than 90% of respondents. These five are closely followed by written communication skills and sense of humor. However, it is worth noting that every competency listed under interpersonal skills was chosen as important by more than 60% of respondents. Clearly, the ability to interact and communicate with a wide range of patrons is essential for successful reference librarians. Similarly, under technical skills, respondents indicated that ability to communicate with patrons using chat and instant messaging is important. Among the general skills customer service was the second highest rated, selected as important by 94% of respondents. Similarly, although it was not one of the top three, the ability to conduct a reference interview was deemed important by more than three-quarters of respondents. Taken together, these results suggest that being able to interact effectively with patrons and to provide a high level of customer service are among the most important attributes of a reference librarian. This is not to suggest that other technical skills are unimportant. 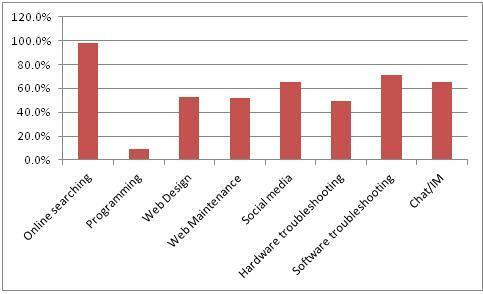 Software troubleshooting, web design and web maintenance are all highly valuable skills, according to the survey. In the final section of the survey, we asked respondents if they saw any skills or qualities lacking in their new hires. It’s important to note that many respondents indicated that their new hires were doing very well, and praised their knowledge and enthusiasm. That said, some respondents said that their new librarians seemed to rely on the same freely available web sources (such as Google and Wikipedia) that their patrons used, and if they were not able to help the patrons using those sources, they did not seem to know where else to go. These participants worried that their new librarians were not adding any value to the research process. Similarly, some respondents suggested that new librarians they worked with did not always have strong interpersonal skills, or were not adept at working with diverse or difficult patrons. There may be plenty of competition for reference jobs in academic libraries, but applicants with strong interpersonal skills and solid knowledge of searching and sources will have an edge. There are several things a current student can do to strengthen her resume and gain more of that edge. Many LIS programs offer, or even require, an introductory reference course, and while this will likely give you a good base of knowledge, it is important to remember it is just an introduction. Anyone interested in pursuing a career in reference would do well to take ‘advanced’ reference courses that delve more deeply into the resources and services in particular disciplines, such as the sciences, humanities, or social sciences, or in particular settings such as medical or law libraries. One question students always ask me is whether they will need a second Master’s degree to work in an academic library. The respondents to this survey did not count a second Master’s as highly important, with only 28.2% of participants selecting that competency. It would appear that experience and background with sources and searching generally is considered most important, although it’s also worth noting that librarians at doctoral-granting institutions seemed to value a second Master’s degree more highly than librarians in other academic institutions. This survey also confirmed the findings of many other studies, that instruction is becoming an ever-more central part of reference. Here again, introductory reference courses will probably address user instruction, but are unlikely to give students a firm grounding or much hands-on experience. Students should seek courses focused on user instruction, especially those that incorporate pedagogy and information literacy, and that give students plenty of practice in speaking in front of groups and actually teaching modules both in-person and online. Interpersonal skills are a little harder to teach and assess in a classroom environment. Certainly, students could take classes that center on diverse and underserved populations. However, job applicants should also identify any co-curricular or work experience (including volunteering and internships) that involves communication, interpersonal skills, and customer service. Retail jobs and waiting tables, for instance, are both jobs that require a high-level of customer interaction, and could be highlighted for a potential employer. As I noted earlier, the findings I report here are really only half of the story- the academic library side. My colleague, Mary Wilkins Jordan did a parallel survey of public librarians, and our comparison of the responses of the academic and public practitioners will be featured in an upcoming edition of RUSQ. I want to finish this post by highlighting a few points. There is a tacit belief in the field that academic and public reference are very different—so much so that practitioners often have a hard time moving to one setting after having worked any length of time in the other setting. Our studies suggest that the differences between reference services in the two types of libraries is actually very subtle, and is more a matter of different emphasis than different competencies. Specifically, public librarians seem to put a little more emphasis on the ‘soft’ or interpersonal skills such as customer service and communication, while the academic librarians were somewhat more likely to choose as important ‘hard’ skills such as ability to engage in evaluation and assessment, or research and publication. However, as you can see here, academic reference librarians also value interpersonal skills very highly. So, the differences seem to be more subtle and the similarities more pronounced than is often believed. We hope that this research might spur further research and conversation about the topic. Laura Saunders received her PhD from Simmons College Graduate School of Library and Information Science in May 2010. She holds an M.S.L.I.S from Simmons as well as a B. A. from Boston University in English Literature and Italian. She worked as a reference librarian and branch manager of the Career Resource Library for Simmons College from 1999 to 2003, where she provided reference and instruction services, as well as participated in collection development, Web page maintenance, and marketing of library services. While completing her PhD, she worked as an adjunct faculty member. Currently, she is an Assistant Professor at Simmons College, teaching in the areas of reference, evaluation of information services, information literacy, and academic libraries. Her first book, Information Literacy as a Student Learning Outcome: The Perspective of Institutional Accreditation was published in June 2011. Her research interests include information literacy, assessment, accreditation, reference services, and the place of libraries in higher education. She has had articles published in The Journal of Academic Librarianship, Library & Information Science Research, College & Research Libraries, and portal: Libraries and the Academy.